Need some last minute affordable sparkly decor for your party? 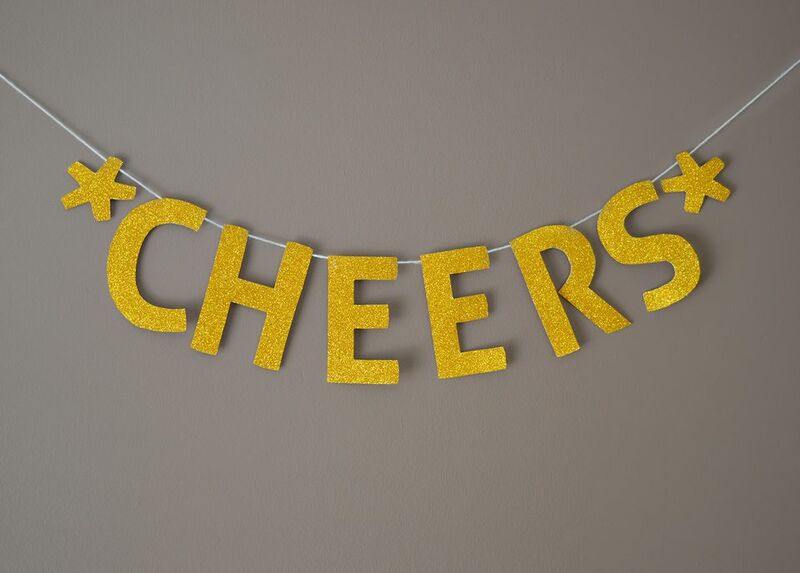 Decorate for your next party by creating your own gorgeous custom party banner that can say whatever you wish in minutes. To make your own party banner all you need is to pick up a few sheets of glitter cardstock paper in your choice of color along with a few basic crafting essentials and you can have your own reusable glitter banner. On the computer, pick a thick bold font and type out whatever you wish your banner to say. Increase the size of the fonts so that you have 2-3 letters per page and print out the words. To save ink you may wish to choose to print the words as an outline instead of solid black ink. Unlike typical hand-drawn banners, this easy method will give professional results by creating your own own stencil first instead of freehand drawing letters. Cut out all the letters from the printed sheets. Flips the sheets of cardstock over to the backside and place the letters onto the cardstock so they are also placed backward. Using a pencil trace all the letters backward on the backside of the cardstock, then cut out all the cardstock letters. Spread out the piece of yarn or string flat and position the cut letters in order so that they are evenly spaced and centered on the middle of the string or yarn. Using the hot glue gun place glue at the top of each letter and attach the string to the back of the top of each letter. Make sure to work one letter at a time as the glue will quickly set. Instead of gluing each letter you can use a hole punch an punch two holes at the top of each letter and string the yarn through the holes on top of the letters instead. Both methods work equally well, with the only difference being if you wish holes at the top or not. If you are using glue allow it to fully dry, once dried your banner is ready to hang. Use tape or tie the ends of the party banner to hang as desired. Happy Holidays, Happy New Years, Merry Christmas, etc..
After the party simply roll up your banner, and store it for the next event. Looking for other DIY related party ideas? Check out these easy do it yourself birthday party themes and these DIY thank you cards that are perfect to send to your guests after the party.